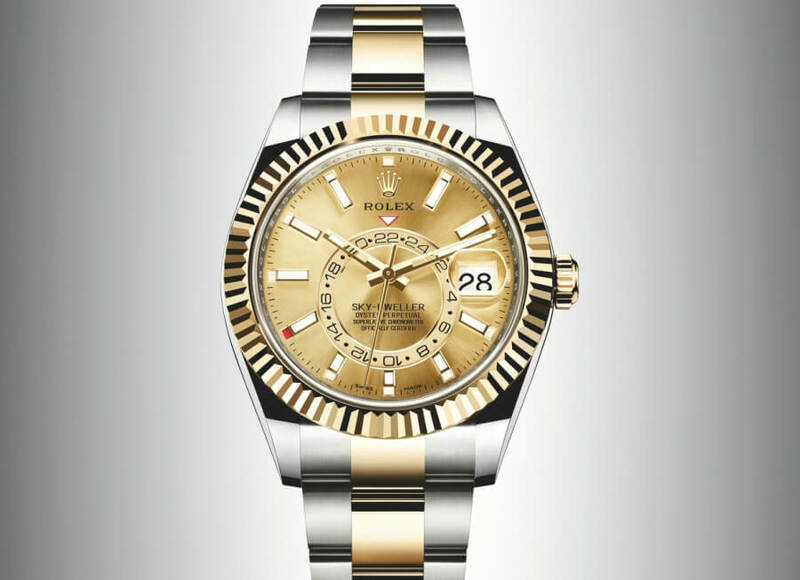 Rolex introduced during Baselworld 2017 the Oyster Perpetual Sky-Dweller, its classic watch for world travellers, for the first time in a choice of yellow Rolesor or white Rolesor versions - combining 904L steel and 18 ct yellow or white gold. The dials now feature rectangular index hour markers and longer hands, as well as a Chromalight display with long-lasting luminescence, which enhances legibility. An elegant watch for world travellers, the Oyster Perpetual Sky-Dweller is a compelling timepiece of revolutionary design that blends to perfection technological sophistication and ease of use. A technological masterpiece protected by 11 patents, the Sky-Dweller provides, in an unprecedented and highly original way, the information global travellers need to easily keep track of time. It includes a dual time zone, with local time read via centre hands and a reference time display in a 24-hour format read via a rotating off-centre disc on the dial; a particularly innovative annual calendar named Saros - after the astronomical phenomenon of the same name – that requires only one date adjustment a year, when the month changes from February to March; and a month display by means of 12 apertures around the circumference of the dial. To set its functions quickly and easily, the Sky-Dweller is also equipped with an innovative patented interface: the rotatable Ring Command bezel. 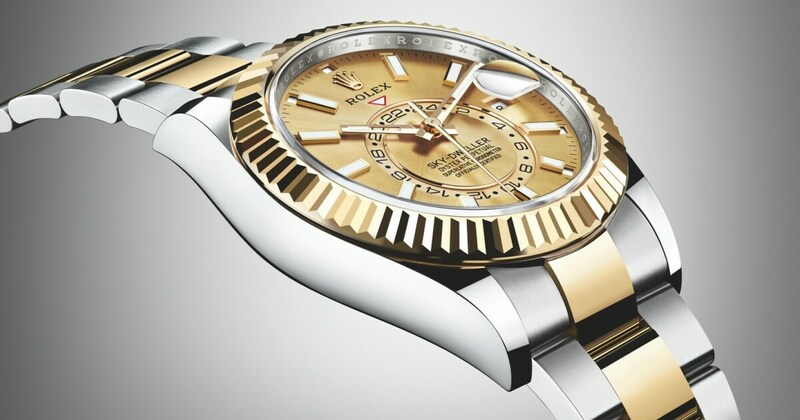 Rolesor, the combination of gold and steel on a Rolex watch, has been a signature feature of the brand since 1933, when the name was registered. It is an auspicious meeting of two metals: one, noble and precious, attractive for its lustre and stability; the other, highly resistant, known for its strength and reliability. All of these qualities perfectly mirror the elegance and performance that come together in a Rolex watch. On the yellow Rolesor version of the Sky-Dweller, the bezel, the winding crown as well as the centre bracelet links are made of 18 ct yellow gold, while the middle case and the outer links of the bracelet are in 904L steel. On the white Rolesor version, the bezel is made of 18 ct white gold, while the crown, middle case and bracelet are in 904L steel. 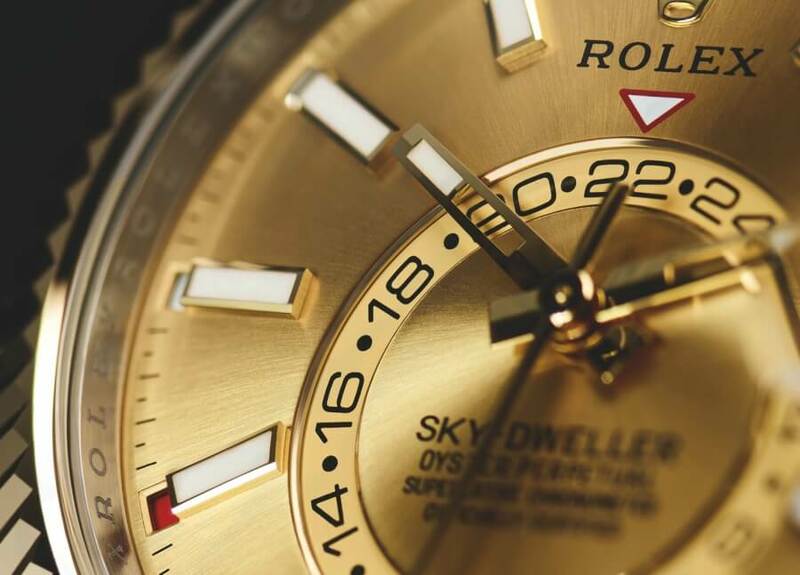 The Sky-Dweller's Oyster case, guaranteed waterproof to a depth of 100 metres (330 feet), is a paragon of robustness. Its characteristically shaped middle case is crafted from a solid block of 904L steel. Its fluted case back is hermetically screwed down with a special tool that allows only Rolex watchmakers to access the movement. The winding crown, fitted with the Twinlock double waterproofness system, screws down securely against the case. The crystal, with a Cyclops lens at 3 o'clock for easy reading of the date, is made of virtually scratchproof sapphire. The waterproof Oyster case provides optimum protection for the Sky-Dweller's high-precision movement. The oscillator, the true heart of the watch, has a blue Parachrom hairspring patented and manufactured by Rolex in an exclusive alloy. Insensitive to magnetic fields, the Parachrom hairspring offers great stability in the face of temperature variations and remains up to 10 times more precise than a traditional hairspring in case of shocks. A Rolex overcoil ensures its regularity in any position. The oscillator is held firmly in place by a height-adjustable traversing bridge and is fitted between high-performance Paraflex shock absorbers, developed and patented by Rolex, that provide 50 per cent greater resistance to shocks. Calibre 9001 is equipped with a self-winding module via a Perpetual rotor and offers a power reserve of approximately 72 hours. A selector wheel on the outside edge of the movement ensures the interaction of the movement and the bezel of the watch to set the functions. The Sky-Dweller is fitted on a solid-link Oyster bracelet in 904L steel, in the case of the white Rolesor version, or, for the yellow Rolesor version, an Oyster bracelet combining 904L steel and 18 ct yellow gold. The Oyster bracelet benefits from the new concealed attachment system beneath the bezel which ensures seamless visual continuity between the bracelet and case. 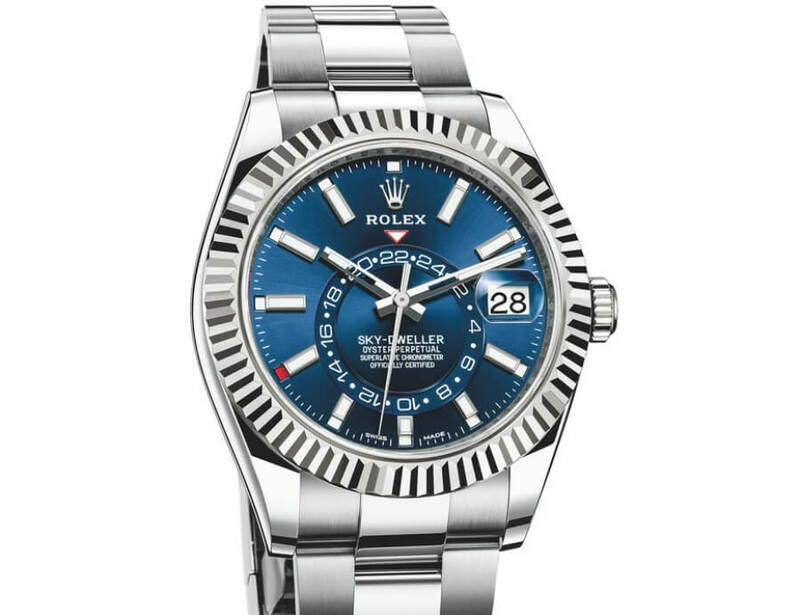 It is equipped with a folding Oysterclasp and also features the ingenious Rolex-patented Easylink rapid extension system that allows the wearer to easily increase the bracelet length by approximately 5 mm, for additional comfort in any circumstance. Like all Rolex watches, the Sky-Dweller is covered by the Superlative Chronometer certification redefined by Rolex in 2015. This exclusive designation testifies that the watch has successfully undergone a series of tests conducted by Rolex in its own laboratories according to its own criteria, which exceed watchmaking norms and standards. The certification applies to the fully assembled watch, after casing the movement, guaranteeing superlative performance on the wrist in terms of precision, power reserve, waterproofness and self-winding. 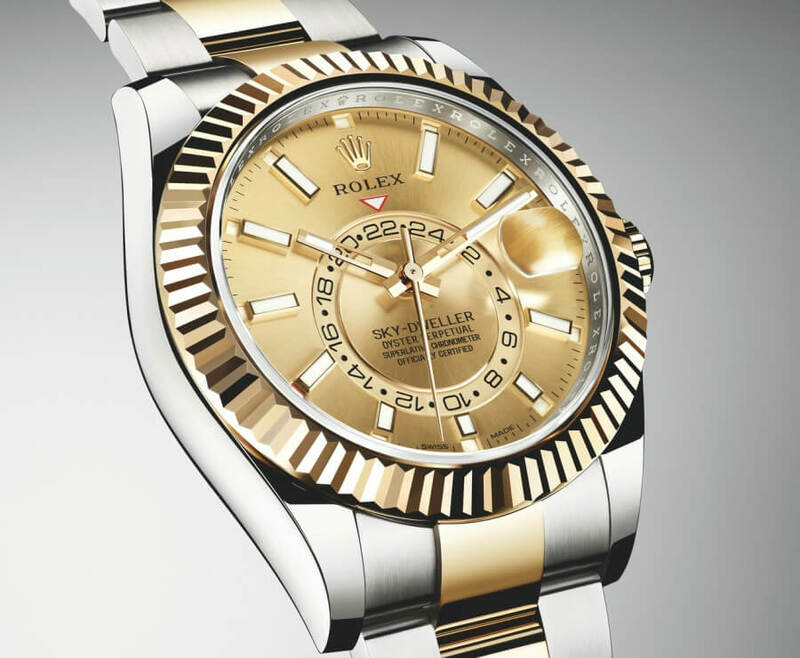 The precision of a Rolex Superlative Chronometer after casing is of the order of -2/+2 seconds per day, or more than twice that required of an official chronometer. The price for ref. 326934 is $14,400 and ref. 326933 $17,150.